The Royal Swedish Motor Yacht Club, K.M.K., is Sweden's oldest motor yacht society, founded in 1915; with some 1700 members and 740 motor yachts. H.M. the King is the defender of the Yacht Club. KMK-R, founded in 1930, is a part of KMK, which organizes high speed motorboat races. The KMK-R Emblem was introduced the same year. 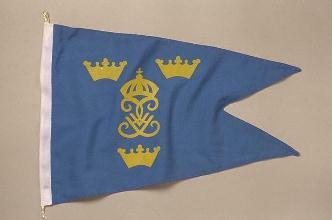 The Pennant of the Yacht Club was introduced in 1915, is blue with the monogram of the founding king, H.M. King Gustaf V, surrounded by three crowns. The Jack is also blue, but has the monogram of the king of the day. There are three stars on the flagstaff side. 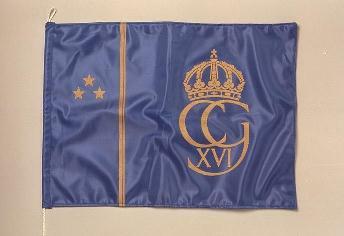 The current Jack, introduced in 1973, has the monogram of H.M. King Carl XVI Gustaf.